Will the 49ers ever learn their lesson with Smith? The Sacramento Bee is reporting that the 49ers are reportedly bringing back their former first overall pick, quarterback Alex Smith for another year. 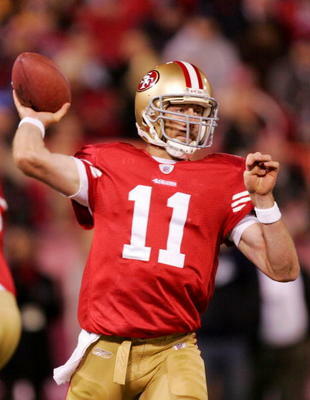 Smith, who has been with the team since 2005, has not lived up to expectations as a number one overall pick, has thrown only 51 touchdown passes compared to 75 interceptions and the 49ers have not made the postseason since his arrival.He has drawn the ire of many 49er fans as a reason, if not the reason as to why the team has been held back in terms of getting better. Is Jim Harbaugh serious about keeping this guy? I don’t understand why this team doesn’t part ways with Smith. Time and time again the 49ers bring this guy back hoping that he can finally show his true potential and it never comes. The fans, the media, and everyone else who follows football closely knows that keeping this guy around does not help this team grow or get any better, and many feel that this team needs that extra ingredient to get better. Instead of keeping a guy who everyone knows is a bust, why not look at a guy who is looking for a new home like a Carson Palmer or a Kevin Kolb? Wouldn’t those two quarterbacks be a major step up from Smith? Or how about drafting a quarterback like Blaine Gabbert? I know drafting and starting a rookie quarterback is a major risk, but it can work. Just look at the rival Rams who went from one win to seven wins with Sam Bradford under center. A guy like Gabbert could be a breath of fresh air for this team. Even the Raiders gave up on their first overall pick quarterback in JaMarcus Russell. If the Raiders can part ways with a guy who can’t get the job done,why can’t the 49ers? To me,the Alex Smith experiment should’ve ended at the third year much like the Russell experiment ended in Oakland. There may be a bigger plan in place as far as Smith goes in terms of using him a s a guy to be in place until a new quarterback is groomed to take the reins, I hope so for the sake of the franchise seeing better days. Given their recent history,however, there is plenty of reasons to understand why it may not be the case. If he continues on as the starting quarterback in San Francisco, I will win a bet. So if my friend Daniel is reading, you better be buying a lot of pink polos,dude. I win this round…again! in the words on mike sando from espns nfc west blog, if you drive a elantra, sure you’d like to upgrade to a lexus, you cant afford it though but the elantra sure beats the hell outa walking everywhere. why make the team worse by getting rid of the only “talent” the team has at quarterback to get a guy a) thats obviuosly lost alot in carson palmer, and b)somebody who is unproven and hasnt looked great when he has played in kevin kolb. those are defenitely not major upgrades. i heard we wouldnt even trade a 7th for kolb. or i assume youd rather draft a qb in a notoriously week qb class and start him right away so we can go through this all again in 6 yrs if it doesnt work out. for christs sake, give him a chance with his first offensive minded head coach. and now he actually has weapons around him (instead of when our best receiver was what, darrel jackson? gimme a break) and we can see wat he can do. harbaughs a good coach and will play to his strengths which is obviously the spread. he has the tools and he’s a smart guy. he can make the accurate throws in tight spots and win football games. alex smith is not the reason we were terrible last year. it was a blatant coaching issue with lack of game planning, management, and schemes. alex smith didnt lose us the game against the saints, he didnt lose the game to the falcons. until there is a obvious upgrade available for qb, i think this is a great move. stability is always good for an offense and especially an offense that has to learn a new system. ← A big part of my life (might be) is leaving tonight!